50mm Castor with Grey Non-Marking Rubber Ideal for both soft and hard flooring surfaces, the 50mm grey rubber castor offers Non-Marking properties and flexibility to provide protection to delicate floors. The Rubber based tyre offers high grip and is suitable for uneven floors such as concrete, as well as smooth floors and most carpets. ..
50mm Non Marking Rubber Fixed Castor – Max 70Kg Features: Strong and Durable – Ideal for Heavy use High Load Capacity and Excellent Abrasion Resistance Zinc Plated Metal for rust and corrosion resistance Floor Protection 70Kg per Castor Temperature range -20°C upto +80°C Sof..
50mm Castor with Grey Non-Marking Rubber (Braked) Ideal for both soft and hard flooring surfaces, the 50mm grey rubber castor offers Non-Marking properties and flexibility to provide protection to delicate floors. The Rubber based tyre offers high grip and is suitable for uneven floors such as concrete, as well as smooth floors and most c..
50mm Castor with Grey Non-Marking Rubber Ideal for both soft and hard flooring surfaces, the 50mm grey rubber castor offers Non-Marking properties and flexibility to provide protection to delicate floors. The Hard Rubber based tyre offers high grip and is suitable for uneven floors such as concrete, as well as smooth floors and most carpe..
50mm Castor with Grey Non-Marking Rubber (Braked) These compact, 50mm Castors with brakes are Ideal for both soft and hard flooring surfaces. The 50mm grey rubber castor offers Non-Marking properties and flexibility to provide protection to delicate floors. The Hard Rubber based tyre offers high grip and is suitable for uneven floor..
50mm Equipment and Floor Protection Castor Light Duty Castors - This 50mm Swivel Castor is manufactured from Non-Marking Rubber to provide ultimate protection to delicate flooring. Zinc Plated Metals and 360 degree swivel top plate, allowing equipment to move in any direction and providing many years of trouble free use. Single Bolt Hole ..
50mm Equipment and Floor Protection Castor (Braked) Light Duty Castors : This 50mm Swivel Castor with Locking Brake is manufactured from Non-Marking Rubber to provide ultimate protection to delicate flooring, such as wood flooring. Zinc Plated Metals and 360 degree swivel top plate, allowing equipment to move in any direction and providin..
Twin Wheel - 50mm Castor - Equipment and Floor Protection This Twin Wheel 50mm Swivel Castor is manufactured from Non-Marking Rubber to provide ultimate protection to delicate flooring. The Twin Wheel Significantly increases the load without increasing the height of the castor, making it extremely robust. Zinc Plated Metals and 360 degree..
Twin Wheel - 50mm Castor with Brake - Equipment and Floor Protection This Twin Wheel 50mm Swivel Castor with locking brake is manufactured from Non-Marking Rubber to provide ultimate protection to delicate flooring. The Twin Wheel Significantly increases the load without increasing the height of the castor, making it extremely robust. Zin..
Twin Wheel - 50mm Castor (Braked) - Equipment and Floor Protection This Twin Wheel 50mm Swivel Castor with wheel brake is manufactured from Non-Marking Rubber to provide ultimate protection to delicate flooring. The Twin Wheel Significantly increases the load without increasing the height of the castor, making it extremely robust. Zinc Pl..
75mm Castor with Grey Non-Marking Rubber Ideal for both soft and hard flooring surfaces, this 75mm grey rubber castor offers Non-Marking properties and flexibility to provide excellent protection to delicate floors. The Rubber based tyre offers high grip and is suitable for uneven floors such as concrete as well as smooth floors and most ..
75mm Non Marking Rubber Fixed Castor – Max 80Kg Features: Strong and Durable – Ideal for Heavy use High Load Capacity and Excellent Abrasion Resistance Zinc Plated Metal for rust and corrosion resistance Floor Protection 80Kg per Castor Temperature range -20°C upto +80°C ..
75mm Castor with Grey Non-Marking Rubber (Braked) Ideal for both soft and hard flooring surfaces, the 75mm grey rubber castor offers Non-Marking properties and flexibility to provide protection to delicate floors. The Rubber based tyre offers high grip and is suitable for uneven floors such as concrete, as well as smooth floors and most c..
75mm Castor with Grey Non-Marking Rubber Single Bolt Fixing, 75mm Non Marking Casters are perfect for soft and hard flooring surfaces. The grey rubber caster wheel offers a Non-Marking characteristic and flexible wheel to provide great protection to delicate floors. 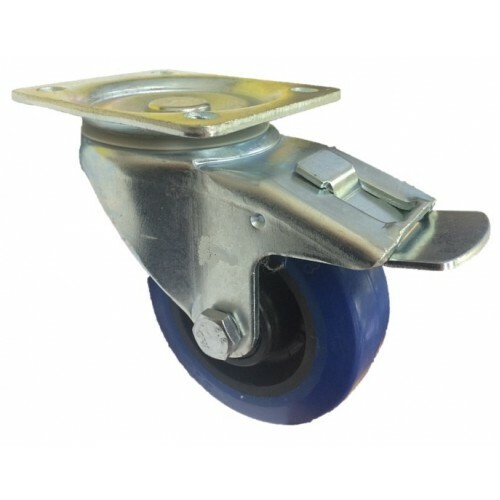 The Grey Rubber wheel provides high grip and is suitable f..
75mm Castor with Grey Non-Marking Rubber (Braked) Single Bolt Fixing Caster Wheel with Locking Brake. The 75mm Non Marking Caster Wheels are ideal for nearly all flooring types. The grey rubber caster wheel offers Non-Marking properties and the flexible wheel provides great protection for use on delicate floors. The Grey Rubber ..
75mm Institutional Castor (Floor Protection Castor) Light Duty Castors Wheels : This 75mm Swivel Castor is manufactured from Non-Marking Rubber to provide ultimate protection to delicate flooring. Zinc Plated Metals and 360 degree swivel top plate, allowing equipment to move in any direction and providing many years of trouble free use. S..
75mm Institutional Castor with Brake (Floor Protection Castor) Light Duty Castors Wheels : This 75mm Swivel Castor with locking brake is manufactured from Non-Marking Rubber to provide ultimate protection to delicate flooring. Zinc Plated Metals and 360 degree swivel top plate, allowing equipment to move in any direction and providing man..
80mm Fixed Castor – Industrial Black Rubber Light Duty Castors Wheels : 80mm Fixed Rubber Castor. Manufactured from High Grade Rubber (NR/SBR). Rubber Castors provide excellent grip and shock resistance, and are suitable for uneven floors such as concrete floors. Each Castor can carry 60Kg Products Specification : Wheel Diamet..
80mm Swivel Castor – Industrial Black Rubber Light Duty Castors Wheels : 80mm Rubber Castor with Ball Bearing Swivel Top Plate. Manufactured from High Grade Rubber (NR/SBR). Rubber Castors provide excellent grip and shock resistance, and are suitable for uneven floors such as concrete floors. Each Castor can carry upto 60Kg Products S..
80mm Swivel Castor (Braked) – Industrial Black Rubber Light Duty Castors Wheels : 80mm Rubber Castor with Ball Bearing Swivel Top Plate and wheel locking brake. Manufactured from High Grade Rubber (NR/SBR). Rubber Castors provide excellent grip and shock resistance, and are suitable for uneven floors such as concrete floors. Each Castor c..
100mm Swivel Castor – Industrial Black Rubber Light Duty Castors Wheels : 100mm Rubber Castor with Ball Bearing Swivel Top Plate. Manufactured from High Grade Rubber (NR/SBR). Rubber Castors provide excellent grip & shock resistance, and are suitable for uneven floors such as concrete floors. Each Castor can carry upto 75Kg Produc..
100mm Swivel Castor (Braked) – Industrial Black Rubber Light Duty Castors Wheels : 100mm Rubber Castor with Brake & Ball Bearing Swivel Top Plate. Manufactured from High Grade Rubber (NR/SBR). Rubber Castors provide excellent grip & shock resistance, and are suitable for uneven floors such as concrete floors. Each Castor can carry..
100mm Swivel Castor – Industrial Black Rubber Light Duty Castors Wheels : 100mm Black Rubber Castor with Single Bolt Hole Ball Bearing Swivel. Manufactured from High Grade Rubber (NR/SBR). Rubber Castors provide excellent grip and shock resistance, and are suitable for uneven floors such as concrete floors. Single Bolt Fixing ideal for fi..
100mm Swivel Castor with Brake – Industrial Black Rubber Light Duty Castors Wheels : 100mm Rubber Castor with Single Bolt Hole Ball Bearing Swivel, and wheel locking Brake. Manufactured from High Grade Rubber (NR/SBR). Rubber Castors provide excellent grip and shock resistance, and are suitable for uneven floors such as concrete flo.. REDUCED!!! - 125mm Fixed Castor (Grey TPR Rubber) - Max 65Kg Product Specification Wheel Diameter: 125mm Wheel Thickness: 30mm Overall Height: 148mm Plate Dimension: 69mm x 96mm Hole Centres: 44mm x 74mm (To Suit M8 Bolts) Load Capacity: 65kg Castor Weight: 0.52kg Bulldog Castors > L..
Castors and Wheels come in many forms and materials. It is therefore important that consideration is taken when selecting the best material for the particular application. From Industrial Trolley Castors, Flight Case Castors to Office Furniture Casters – They all have different factors which affect the selection of the material. Rubber Wheels include various types of Material composition, however they generally fall into Natural Rubber or Synthetic Rubber, and sometimes a mixture of the two. Also, the term “Rubber” can be used loosely to describe Polyurethane Casters. Rubber compounds can be manufactured in different rubber hardness’ to suit the specific application. Polyurethane Casters – Manufactured from various grades of PU to provide various properties.